Another night bus to Arequipa – seems like all arrive between 5-6AM; the streets were silent. Sunday meant that most of the tourist attractions were closed, so we walked around, exploring the “White City.” Our Italian friend, Luca, recommended Friendly AQP Backpackers which proved to be a nice and relaxing stay. Bonus, we had our laundry done (and didn’t have to use the bathtub this time!). 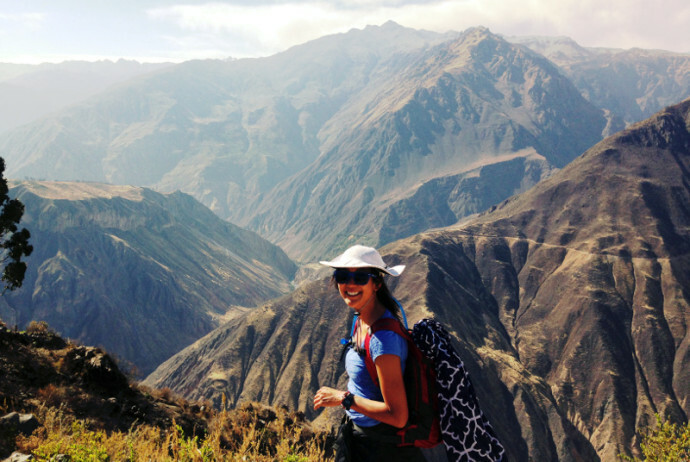 The next day, we headed off to Colca Canyon – there were tours offered, but we decided to set off on our own using public transportation. 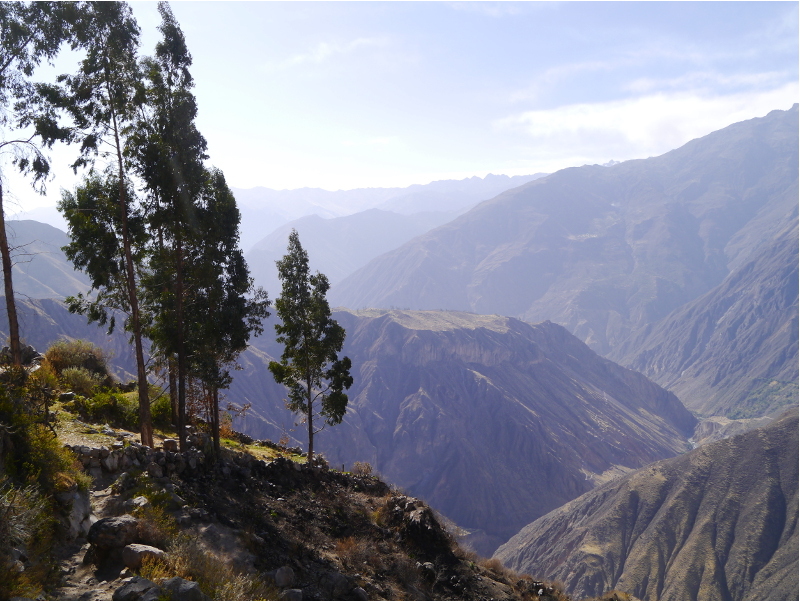 Colca Canyon is the 2nd deepest in the world (missing the record by 150 meters) and known for condors, gigantic scavengers. Up close, condors are not that pretty, but their huge wingspan and endangered status brings many tourists to Cruz del Condor, a look out where they are fed every morning. 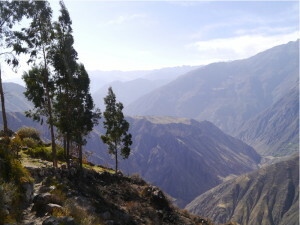 We skipped the lookout and started our hike down from one end of the canyon, from the town of Cabanaconde. 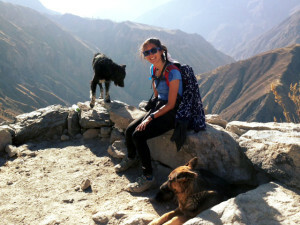 We met two stray dogs in the main square and they followed us for the two hour hike down to Sangalle, “The Oasis”. It was the evening – we were the only two hiking as most of the tour groups head down after lunch. 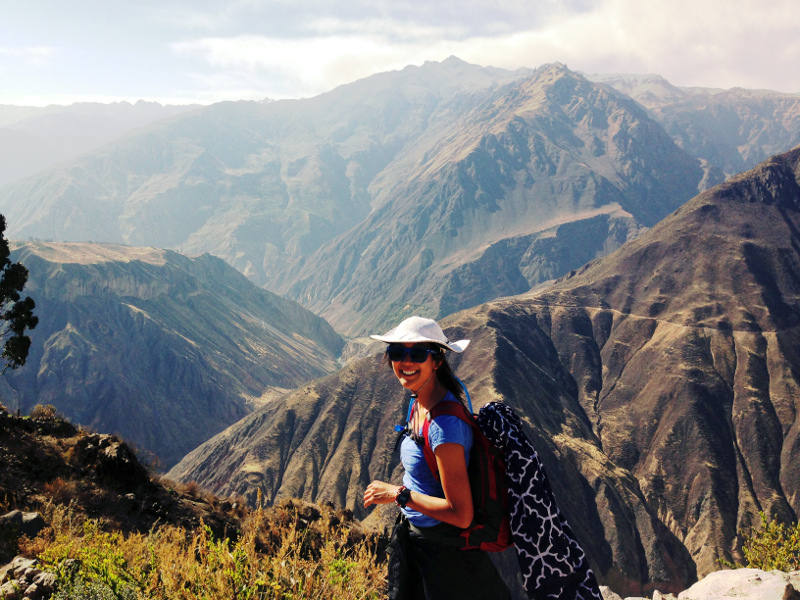 We were lucky to spot a condor gliding around the canyon as we started down the steep path. The trail was very slippery from all chalky dust that covered the trail, so we had to split our time focusing on not falling and enjoying the amazing scenery. 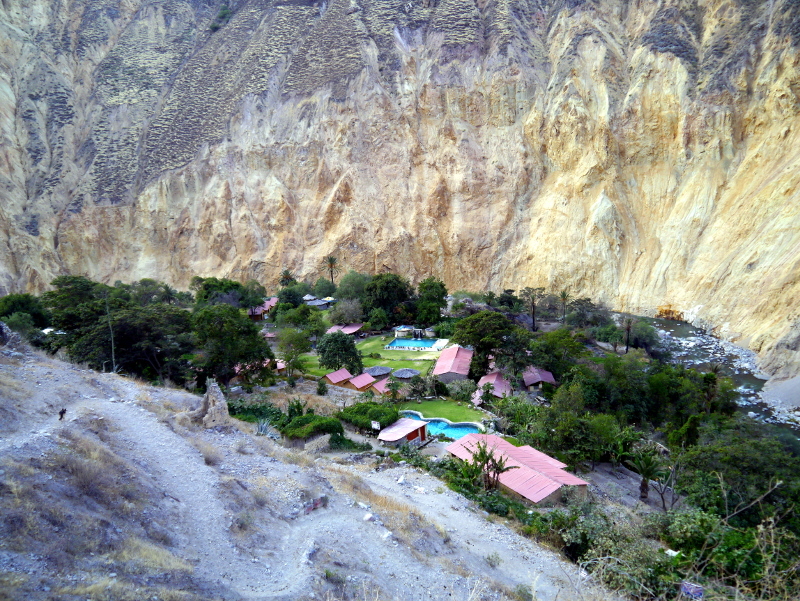 I was expecting this small town around an oasis in the center, but what we found at the bottom were 5 self-contained resorts (albeit with basic accommodations), each with a private swimming pool. We arrived right at sunset, so there wasn’t too much time to explore (and definitely too cold to swim). All guides had advised us to start hiking back up the canyon no later than 6AM to avoid the equatorial heat. We were both not looking forward to the hike, as it said to allow 3-4 hours – all straight up hill. Slow and steady, we managed to reach the top in 2 hours with one of the pups who had followed us down. He followed us all the way onto breakfast (unfortunately the restaurant wasn’t dog friendly) and on to the bus stop. We were sad we couldn’t take him with us. 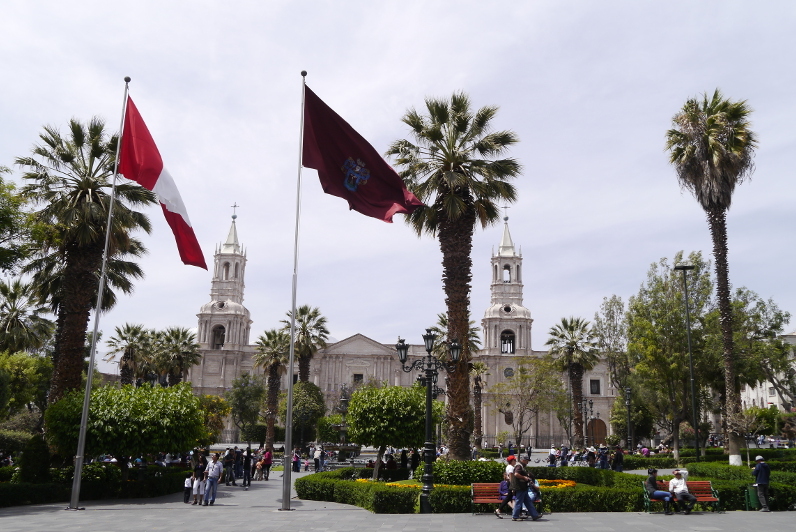 We had a relaxing day when we returned to Arequipa, where we chatted with a few other travelers and hung out with the night shift’s adorable 2 year old, Valentina. We had no exposure to any media while in the canyon, so we were surprised to hear there were strikes in the mines, blocking the roads to Cusco and Puno. We had planned to leave early for Puno to get our first glimpse of Lake Titicaca, but everyone told us that we would have to stay until at least Sunday (another 3 days) for the strikes to end. Early the next morning, we checked the news – the strike was still on. We called one bus company which said all their routes to Puno were cancelled. Rats… We discussed staying a few more days over breakfast, but in a last-minute change of heart, we decided to go to the bus terminal and try to get as close to Lake Titicaca as we could. Routes to Jaliaco, a town about an hour away from Puno were said to be clear. 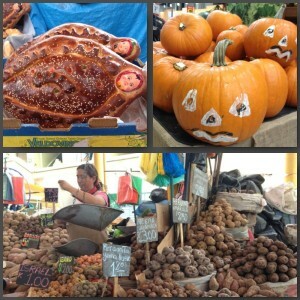 We arrived to the bus terminal and to our surprise, a few companies said they were running busses to Puno. I was very skeptical- I’m the cynic and Matt tends to have more faith in what people say. I asked the lady how the bus was getting through the strikes. Her response, “We are taking an ‘alternative’ route”. I was not sure exactly what that meant, but Matt had already purchased the ticket. “Come on, half of the adventure is getting there!” Famous last words? As we boarded the bus, I felt a little more comfortable as it was filled with locals who also said they were headed to Puno. We were what we thought should be about the 3/4 mark, when the bus made a sharp right turn onto a dirt road. We didn’t think anything of it until all the locals started gawking out the window and chattering about what was going on outside. Ah yes, the alternative route. The dirt road was so bad that the bus decided it would go off-roading to skip large portions of the already side, side-route. About an hour down the road, the bus driver went around in a few circles and stopped to chat with the towns we passed, presumably to ask for directions. The other passengers started banging their feet and yelling at the driver – mutiny on board! Luckily for the driver, the bus was set up like a double decker with the driver below and passengers above with only a telephone to communicate. We arrived to Puno 4PM on the dot, just like the bus ticketing lady promised. 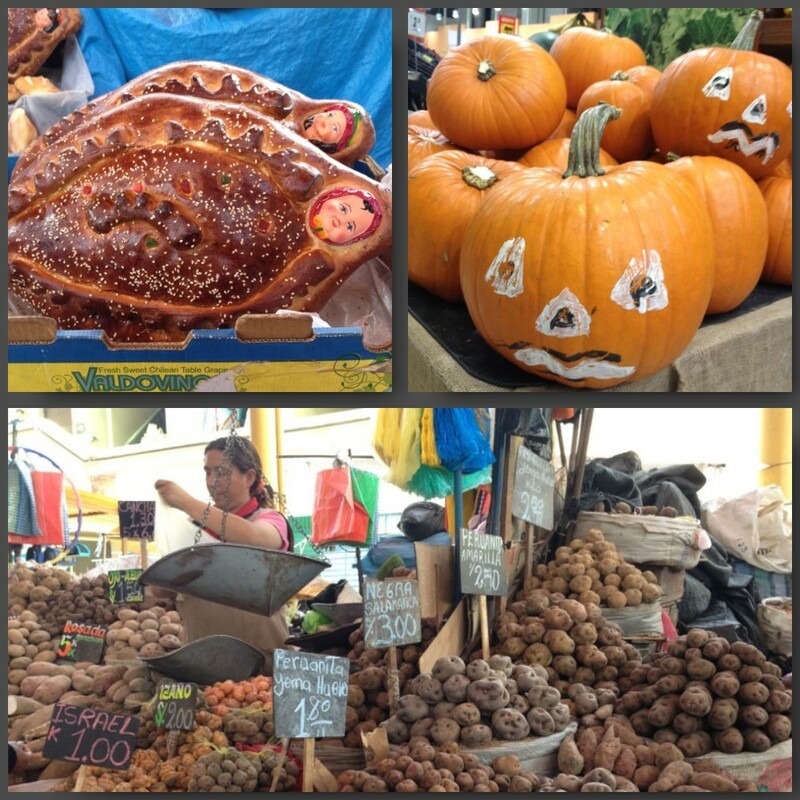 Our final Peruvian city!